In today's increasing cost-conscious economy, SMBs are looking for feature-rich IP-PBXs at the lowest cost. Many SMBs are willing to sacrifice some advanced telephony features to just get the basics, including call transfer, three-way conferencing, auto-attendant, and voicemail. Advanced features such as call queues or call recording are nice features to have, but many SMBs aren't willing to pay for higher-end IP-PBXs with this functionality. Fortunately, Grandstream's GXE5024 and GXE5028 products not only have the "basics", they also have some advanced functionality such as call queues -- and at a reasonable price of just $899 for the GXE5024 and $1399 for the GXE5028. Grandstream sent me a GXE5024 for a test drive review. First, the only difference between the GXE5024 and the GXE5028 is the number of analog PSTN FXO ports - 4 ports vs. 8 ports. They both also sport two FXS ports for connecting analog phones, fax machines, etc. The 5028 has 2 more conference bridges, allows bigger capacity for voicemail/faxmail and in the future, videomail, supports more concurrent accesses to IVR voice menus/voicemail/faxmail, supports more registered extensions and concurrent calls (in an upcoming official release soon). What's nice about the GXE502x is that SMBs don't have to get rid of their existing local analog lines if they don't want to. They can slowly add one or two VoIP SIP trunks into the GXE502x system and migrate from analog trunks to SIP trunks over time. Hooking up the GXE5024 was a snap. What's nice is that it sports a Power over Ethernet (PoE) port on the LAN interface, so you can skip the use of the included AC adapter if you want. I logged into the default IP address 192.168.10.1 for the GXE5024. It sports a quick set-up wizard which is pre-configured with basic call settings that enable you to quickly configure your GXE. I tried both the wizard and non-wizard method and both are pretty straightforward. From the web interface, I clicked the Auto Provision link, which kicks off auto-detection of any Grandstream phones I connect to the same LAN segment. I simply had to select a "Starting extension" (701) and "Ending extension" (703) to set my extension range. For testing purposes I had a couple of Grandstream GXP2000 phones and a GXV3000 video phone. I booted all the Grandstream phones and they immediately discovered the Grandstream GXE5024 and were autoassigned extensions 701-703. Next, I figured I'd try some third party phones to see if the auto-provision worked with them as well. I attempted an Aastra 57i and a Polycom IP-650 phone, but neither seemed to auto-provision. The phones did discover the TFTP boot server (Option 66 via DHCP) on the GXE5024, but they weren't assign an extension or any SIP settings. Although the auto-provisioning didn't work, I was able to manually add the phones with no trouble. After configuring some extensions, the next step was adding some trunks. The GXE5024 supports 4 analog lines, so I configured it to use a 4-port Teltone analog simulator very easily. In addition, I was able to assign extensions 790 and 791 to the two analog FXS ports, which can be used for analog phones, credit card machines, or fax machines. I also configured a SIP trunk using one of the promotional "trial" SIP trunk providers built into the Grandstream. For unified messaging, it supports a voicemail-to-email feature with the ability to set the proper SMTP settings for proper email routing. Additionally, it also supports fax-to-email and can also automatically detect fax tones and route it to a user's fax mailbox. This is done per extension, so users can simply logon to their web portal using their username and password and retrieve their voicemail and faxes. Obviously, with a web interface, remote teleworkers can access voicemail and faxes quite easily. Your personal web portal also lets you manage individual phone/call settings. The GXE502X supports 2 (GXE5024) or 4 (GXE5028) password protected conference bridges that allow up to 12 (GXE5024) or 20 (GXE5028) simultaneous participants from PSTN trunks, SIP trunks or Internal Extensions. You can simply dial the conference bridge extension to join, or even invite other participants by entering in their extension from the web interface. Administrators can also mute/unmute conference participants from the web interface as well as kick them out. I liked that I was able to record the auto-attendant greeting from the web admin simply by choosing my extension to ring, but the same is not true for users. Unfortunately they can't ring their desk phone from their personal web portal to record their personal greeting. Instead, users have to record in a specified format - 8kHz,16 bits, mono and manually upload it via the web tool. Of course, they can also dial into the voicemail system and record their greeting. It's just a nice feature to be able to do it via the web rather than navigating the voicemail system. Important to most small and medium businesses is support for hunt/ring groups. The GXE502x series supports parallel (simultaneous) ringing, as well as serial or round-robin ringing. Adding various auto-attendant menus such as business hours, after hours, and holidays was pretty straightforward. It lets you select days of the week as well as specify exception dates, i.e. 12/25 for Christmas, 1/1 for New Years Day, etc. Overall, defining call routing rules and auto-attendants was pretty easy to do. One of the most powerful features of the GXE502x is the ability to define call queues so calls are answered in the order they were received and assigned to agents with the best skills. Having advanced queues and skills-based routing in such a low-cost IP-PBX is unheard of, so I tip my cap to Grandstream. Priority: Lets you set the priority of the call queue from the drop down list. Queue Status Update Frequency: This determines how often callers will be updated on the status of the queue via an uploaded update message. Other Announcements: This determines the frequency in which any other announcements that the user has added will be played tcallers in the queue. Maximum Caller Wait Time: This field lets you set the maximum amount of time that callers will wait within the queue before being forwarded to voicemail. Maximum Queued Callers: This field allow users to set how many callers can be within the queue simultaneously. Group Email Address for Voicemail Delivery: Enter the email address where all voicemail for the queue/group will be delivered. Automatic Call Distribution: This setting lets users configure, enable and disable skill-based call routing. If skill-based routing is enabled, users can configure the call to be routed to the least skilled or most skilled agent first. The skill level for each agent can be configured on the agent page. Ring Mode to Agents of Same Skill Level: This feature is similar to that of hunt/ring groups as users can configure the mode in which agents of the same skill level will ring. Serial - Agents ring one at a time based on availability. Parallel - All agents ring simultaneously. Circular - A different agent will ring first each time a caller enters the queue. Least Busy - The least busy agent will ring first. Serial Ring Attempts Per Member: If the serial ring mode is selected, you may select the number of ring attempts to each agent before forwarding the call to the next agent. Serial Ring Interval: If the serial ring mode is selected, users may set the ring time interval (in seconds) between call queue members. It also supports "Agent Call Wrap-Up Time" which allows users to specify the amount of wrap-up time an agent will have before receiving another call (time between two calls). One really cool feature is that the GXE will allow admins to capture all the packet traffic coming in and out of either the LAN or WAN Ethernet interface of the GXE. This is very helpful to debug certain configuration issues and do SIP troubleshooting. 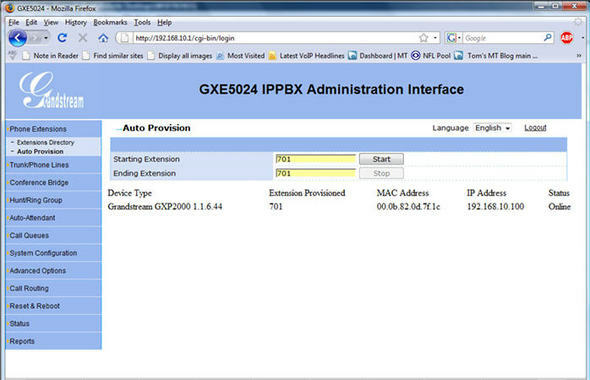 The GXE502x supports peering with other IP-PBX systems. While this may not be critical for SMBs, as companies do grow, they can deploy multiple GXE502x devices if they so desire and have a unified extension dialing plan that routes calls over IP. Further, larger organizations might deploy the GXE502x at branch office locations and peer back to their main corporate headquarters' IP-PBX. I asked Khris Kendrick, Sr. Director Business Development for Grandstream some questions about the GXE502x. I asked, "Since this product was launched, how has this been performing in your channel?" Khris responded, "The product has been in the market for over a year now and it has receive great accreditation from our users and distributors, that said we will be offering more power and features to the IP-PBX in the near future." "What are the top couple of features customers like the most in the GXE?" He responded, "The main features are the multiple Auto Attendant capability, One-Button-Service Provider Provisioning, ACD and UC features, our fax to email is definitely a fav." Lastly, I asked, "What key advantages does the Grandstream GXE product line have over some of your IP-PBX competitors within the SMB space that often cause customers to choose your product?" Khris answered, "One-Button provisioning, Mulitmedia capability(video surveillance) support, Hybrid FX0/FXS and embedded fax server." Overall, I was very impressed with the feature-set of the GXE5024. It's very small and lightweight partly due to its use of Flash memory and not a hard drive. I still find it amazing that such a lightweight PBX can pack such a powerful punch. After all, the PBXs of old weren't called "big iron" for nothing! The GXE502x appliance is a excellent all-in-one communication solution for small-to-medium sized businesses sporting a plethora of features at an attractive price-point, so I would not hesitate to recommend it. Relies on external PoE switch for IP phones Would be nice if it had a 4 port PoE switch built it, especially for SMBs looking for a "unified" phone platform. Less costs and one less support vendor to deal with. In today's increasing cost-conscious economy, SMBs are looking for feature-rich IP-PBXs at the lowest cost. Many SMBs are willing to sacrifice some advanced telephony features to just get the basics, including call transfer, three-way conferencing, auto-attendant, and voicemail. Advanced features such as call queues or call recording are nice features to have, but many SMBs aren't willing to pay for higher-end IP-PBXs with this functionality. Fortunately, Grandstream's GXE5024 and GXE5028 products not only have the \"basics\", they also have some advanced functionality such as call queues -- and at a reasonable price of just \$899 for the GXE5024 and \$1399 for the GXE5028. Grandstream sent me a GXE5024 for a test drive review. I tried both the wizard and non-wizard method and both are pretty straightforward. From the web interface, I clicked the Auto Provision link, which kicks off auto-detection of any Grandstream phones I connect to the same LAN segment. I simply had to select a \"Starting extension\" (701) and \"Ending extension\" (703) to set my extension range. For testing purposes I had a couple of Grandstream GXP2000 phones and a GXV3000 video phone. I booted all the Grandstream phones and they immediately discovered the Grandstream GXE5024 and were autoassigned extensions 701-703. After configuring some extensions, the next step was adding some trunks. The GXE5024 supports 4 analog lines, so I configured it to use a 4-port Teltone analog simulator very easily. In addition, I was able to assign extensions 790 and 791 to the two analog FXS ports, which can be used for analog phones, credit card machines, or fax machines. I also configured a SIP trunk using one of the promotional \"trial\" SIP trunk providers built into the Grandstream. It also supports \"Agent Call Wrap-Up Time\" which allows users to specify the amount of wrap-up time an agent will have before receiving another call (time between two calls). I asked Khris Kendrick, Sr. Director Business Development for Grandstream some questions about the GXE502x. I asked, \"Since this product was launched, how has this been performing in your channel?\" Khris responded, \"The product has been in the market for over a year now and it has receive great accreditation from our users and distributors, that said we will be offering more power and features to the IP-PBX in the near future.\"
\"What are the top couple of features customers like the most in the GXE?\" He responded, \"The main features are the multiple Auto Attendant capability, One-Button-Service Provider Provisioning, ACD and UC features, our fax to email is definitely a fav.\"
Lastly, I asked, \"What key advantages does the Grandstream GXE product line have over some of your IP-PBX competitors within the SMB space that often cause customers to choose your product?\" Khris answered, \"One-Button provisioning, Mulitmedia capability(video surveillance) support, Hybrid FX0/FXS and embedded fax server.\"
Overall, I was very impressed with the feature-set of the GXE5024. It's very small and lightweight partly due to its use of Flash memory and not a hard drive. I still find it amazing that such a lightweight PBX can pack such a powerful punch. After all, the PBXs of old weren't called \"big iron\" for nothing! The GXE502x appliance is a excellent all-in-one communication solution for small-to-medium sized businesses sporting a plethora of features at an attractive price-point, so I would not hesitate to recommend it. Relies on external PoE switch for IP phones Would be nice if it had a 4 port PoE switch built it, especially for SMBs looking for a \"unified\" phone platform. Less costs and one less support vendor to deal with.